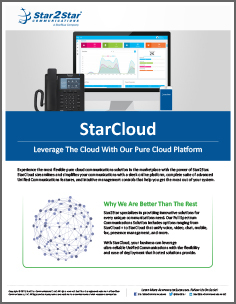 StarCloud provides superior VoIP quality, reliability, and flexibility for customers in need of an intuitive, easily deployed solution. Experience the most flexible pure cloud communications solution in the marketplace with a system that streamlines and simplifies your communications. StarCloud offers a sleek online platform, complete suite of advanced Unified Communications features, and intuitive management controls that help you get the most out of your communications. Star2Star specializes in providing innovative solutions for every unique communications need. Our Full Spectrum Communications Solution includes options ranging from pure to on-premise cloud that unifies voice, video, chat, mobile, fax, presence management, and more. With StarCloud, your business can leverage ultra-reliable Unified Communications with the flexibility and ease of deployment that cloud solutions provide. 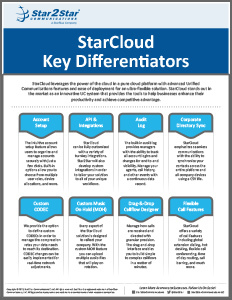 StarCloud leverages the power of the cloud in a pure cloud platform with advanced Unified Communications features and ease of deployment for an ultra-flexible solution. Leverage this innovative UC system that provides the tools to help businesses enhance their productivity and achieve competitive advantage.